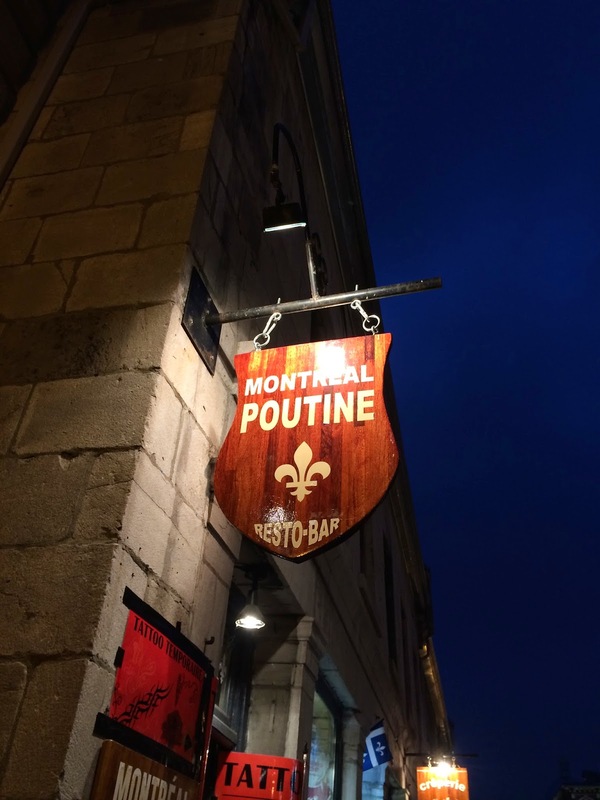 It's a well-known proverb, but in my case, it's "When in Montreal (Quebec), keep eating poutine" while not knowing if Quebecois would eat as much as I do (like every day). On the day we arrived at Montreal, we made sure I would get poutine to celebrate the return of the queen of poutine by researching poutineries beforehand. 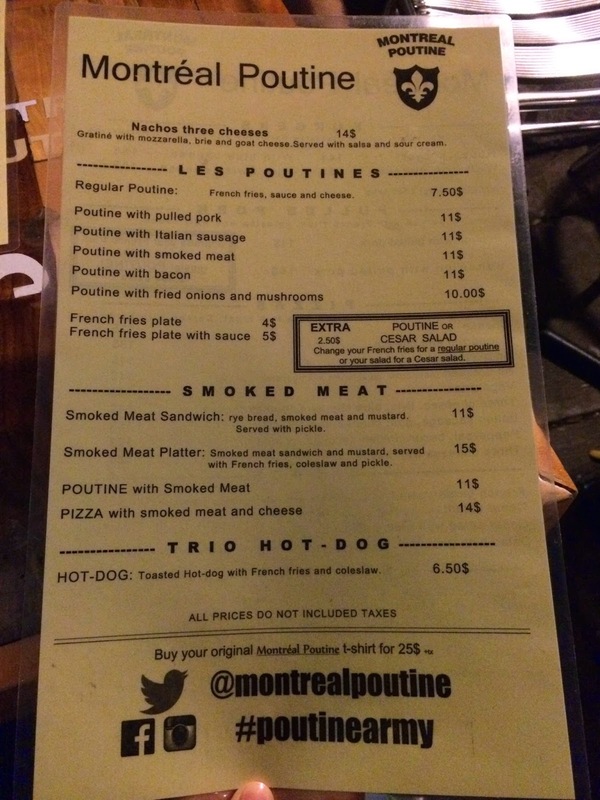 The place we chose to go to that night is "Montreal Poutine" in Old Montreal and it's one of the restaurants that were participating La Poutine Week 2014. We got here around 8:45 PM on Sunday night, and I was surprise to see many restaurants were open given that even in Downtown, the shops close early (like 6PM) Sunday through Wednesday. 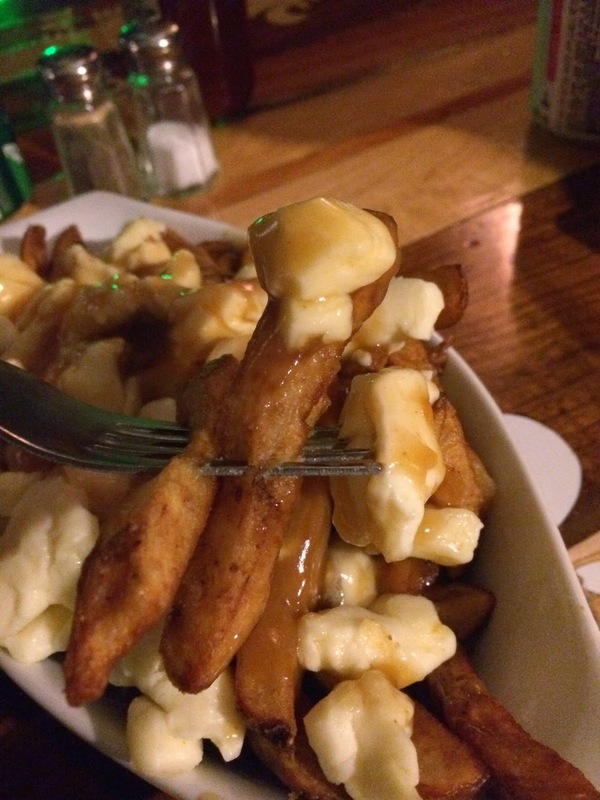 There're a couple of Montreal Poutine, but the one we went to was a little bit weird design. 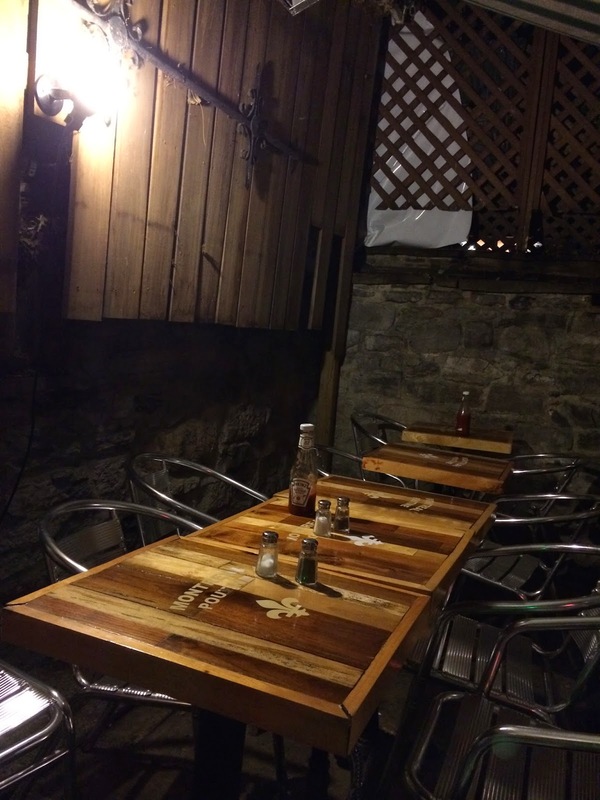 Somehow, we had to go through some tattoo shop to get to the terrace seat. It's just started raining so we asked to open the awning, then like a minute later, it's pouring. There's an "express" which is maybe to-go, has limited selections of menu, or to eat standing up and also tables inside, too. Soon menus were brought and I ordered a ginger ale and a regular poutine. 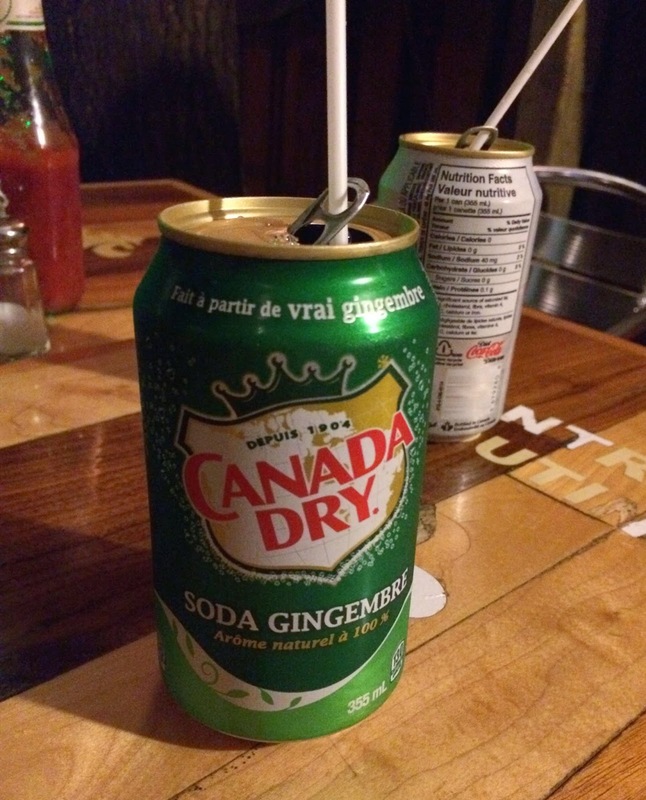 A can of Canada Dry with a straw sticking in was served. The straw was held well with the pull tab. It's fries, gravy sauce and cheese curds. The green spots were reflection of the lights there, FYI. They used real cheese curds and they're squeaky. Thick fries were golden brown (or close to brown), but only a few fries were crispy and the rest was soft and oily. I don't think the fries were salted. Gravy was slightly starchy, sweet, not salty, and had a strong celery flavor. 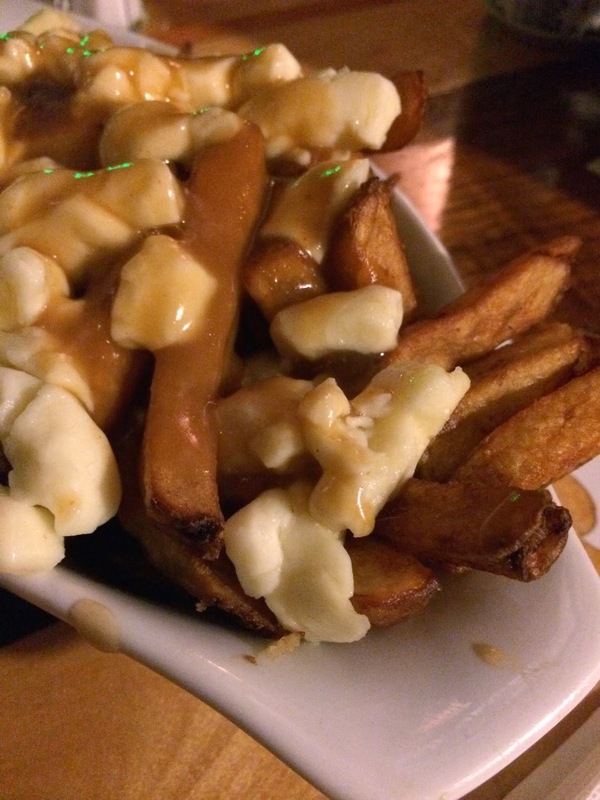 I didn't like the fries but gravy sauce was quite good and there're so many cheese curds, which was great.